Born twenty years to the day after John Lennon and married the day before 9/11, I need no calendars or tickler systems to remind me of the milestone birthdays and anniversaries in my life. The media does it for me. So I was well aware of the approach of my half-century mark. Still, I had made no special plans for that particular day, which is probably just as well since I found myself attending a funeral. The funeral was for Andrew Smolenyak, an uncle of my husband's and of mine by marriage (In spite of the rarity of the surname, it's a fluke that my husband and I were both born Smolenyaks, and DNA testing shows that our respective Smolenyak families are not related - a story for another time). His passing was a watershed within my husband's family for several reasons. He was the last WWII vet, having been on board a ship off the coast of Japan and much relieved at the time of the Japanese surrender. He was the last of the ten siblings, bringing an entire generation to a close. And he was the last to remember the immigrants. Just a week earlier, he had told us how his old country father had complained about how hard shepherding was ("you had to stay out all night in the freezing cold to keep the wolves away"), but transitioned well enough in the new world to enjoy umpiring for his sons' baseball games. 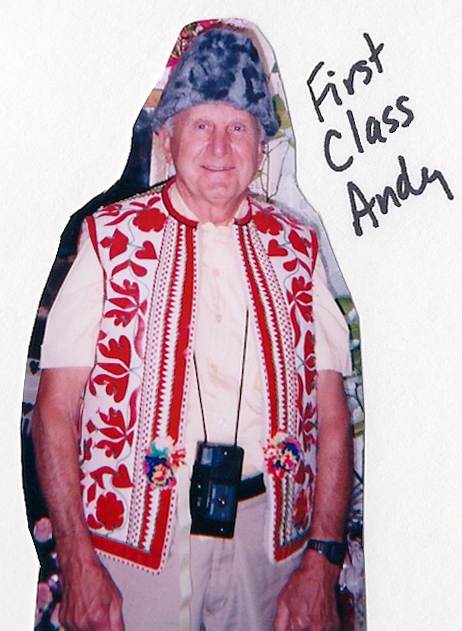 "First Class Andy" (a snafu during a reunion in Slovakia resulted in his flying first class and earning this nickname) was also at least partially responsible for two very important aspects of my life - my husband and my livelihood. Andy was gifted with a mechanical mindset and able hands, and ran a garage called Smolenyak's Auto Body for a number of years. As a youngster of perhaps five, I spied the shop on a road trip in Pennsylvania with my grandparents. Barely old enough to recognize my own multi-syllabic name, I asked my grandparents about it, but was shushed and told it wasn't important. But it was that dusty memory that kept me looking for Smolenyaks outside of my own family even after years of pre-Internet research had failed to turn up others. I knew someone had to have owned that garage, and my constant searching eventually led me to my husband's family. So it was that I first encountered my future husband as an entry in a genealogical database. Meanwhile, those years of sleuthing had turned me into a skilled genealogist, which eventually became my profession. So I owe a debt of gratitude to Uncle Andy for helping lead me to both a husband and career I adore. If I'm to be honest, attending a funeral was not high on the list of things I wanted or expected to do on my 50th birthday, but in many ways, it was exactly what I needed. It certainly caused me to pause and reflect, something I rarely do in the midst of my typically manic life. I thought about how First Class Andy had journeyed 8,000 miles around the Southwest with a wood-working buddy earlier this year, and decided to follow his example by making fun more of a guiding principle in my own life. The funeral was also a chance for a mini-family reunion, albeit a bittersweet one. And it reminded me of the ripple effect our choices and actions can have on others, just as Andy's decision to open a garage touched the life of a little girl who happened to drive by with her grandparents. Punctuating this reflection was a steady stream of birthday wishes that rolled in on Facebook that day, eventually wearing out my iPhone battery. These happily reminded me of the decades of opportunity I've had to travel the globe meeting wonderful people in every corner and left me with the hope that just maybe some of my choices were sparking tiny, positive repercussions, even if I might never know of them. Lennon was so right when he said, "Life is what happens when you're busy making other plans." And sometimes that's a good thing.